Studio Line: Columbia TriStar - The Life of the Party... before she got a life. When Gwen borrows her sister's (Elizabeth Perkins) wedding limo and plows it into someone's front porch, the wild life she shares with her boyfriend Jasper (Dominic West) comes to a screeching halt. Earning herself a DUI and a 28-day stretch in rehab. She faces an unthinkable set of rules (no cell phones!) and some strange rituals, like chanting and (gulp!) sharing her feelings. Joining up with an eccentric group of fellow rehabbers let by the inimitable Counselor Cornell (Steve Buscemi), Gwen embark son a touching and often hilarious road to recovery, where she learns that life is not always a party and that real happiness comes from within. Box Office: Budget: $43 million. Opening Weekend: $10.31 million (2523 screens). Gross: $37.035 million. DVD: Widescreen 1.85:1/16x9; audio English DD 5.1 & Dolby Surround; subtitles English; closed-captioned; single sided - dual layered; 28 chapters; rated PG-13; 104 min. ; $24.95; street date 9/19/00. Supplements: Director, Editor, Composer and Producer Commentary; HBO Making-Of Special; Character Testimonials; "Santa Cruz" Soap Opera: The Lost Episodes; How to Make a Gum Wrapper Chain; Guitar Guy's Lost Songs; Isolated Music Score; Theatrical Trailers; Talent Files; Production Notes. Could someone please explain to me why Sandra Bullock is considered an "A-list" actress? Of all the films in which she's played a lead, a whopping one - Speed - topped $100 million, and in that picture, she was billed fourth after Keanu Reeves, Dennis Hopper, and a bus. The biggest hit in which she truly starred was 1995's While You Were Sleeping which grossed a respectable but decidedly unspectacular $81 million. Nonetheless, Bullock remains regarded as a big-time film star, and her name apparently green-lights a lot of mediocre material. 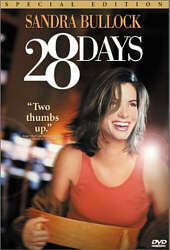 Latest entry on her roster of blandness: 28 Days, a glorified TV movie that examines the trials and tribulations of a woman's stay at a rehab clinic. Bullock plays Gwen Cummings, a babe who just loves to party. The hammer falls after she ruins the wedding of her sister Lily (Elizabeth Perkins) and crashes a limo into a house. Instead of jail, she gets a chance to fix her life through a stay at the Serenity Glen, a center for addicts like herself. The plot follows a frightfully predictable path that offers literally no surprises. Gwen initially fights against the system at the clinic but eventually buys into it. She's tempted multiple times but works through the dangers. She meets a roster of wacky characters with all of their own issues, and some of them don't end up in positive situations. Blah blah blah - the end! I can't say 28 Days is an unenjoyable movie, but it's one of those films that doesn't really seem to need to exist. We've seen so much material of this sort through the years that there's absolutely nothing new to say; this topic was tired when Clean and Sober did it back in 1988, and it hasn't gotten any fresher over the last 12 years. Even if someone could have discovered a new angle, they weren't involved in this project. Writer Susannah Grant took on another tired topic - David vs. Goliath battles against corporate greed - in Erin Brockovich but that film worked largely because of the presence of an inspired director, Steven Soderbergh. In this case, Betty Thomas has proven herself to be a mildly-solid director of comedies like Private Parts and she makes 28 Days move at a respectable pace, but her comic tendencies are part of the problem here; the film comes across as too comedic and the attempts at drama seem forced and unnatural. Some mildly amusing moments result, but they feel out of place in this sort of film and they render the serious moments impotent. Bullock is decent as Gwen, though I really didn't buy her as a drunk/addict; she stayed too cute and bubble to be believable. In addition to the lovely Perkins, her supporting cast includes folks like Viggo Mortensen, Diane Ladd and Steve Buscemi - playing against type as a counselor - but does little with any of them; it's Bullock's show and she remains the focus at virtually all times. 28 Days isn't a complete flop, but it seemed flaccid and pointless. It's a great movie to show high school students to warn them about the dangers of drink and drugs, but other than that, I can't imagine who would find this film interesting. Actually, to make the movie more fun, perhaps you could watch it with friends and bet on which character will come to a negative end; it'd definitely add some spark to the dull proceedings. 28 Days appears in its original theatrical aspect ratio of approximately 1.85:1 on this single-sided, double-layered DVD; the image has been enhanced for 16X9 televisions. Columbia-Tristar (CTS) are known for their fine video transfers, and this one won't do anything to alter that reputation. Sharpness appears consistently excellent, with a crisp and well-defined picture that never betrays the slightest softness. Actually, some fuzziness does occur, but those segments are clearly intentional and are meant to reflect Gwen's inebriated state, so I certainly won't fault the transfer for that. Moir� effects popped up a few times, mainly due to striped shirts, but jagged edges seemed absent and the artifacts from the anamorphic downconversion on my 4X3 TV seemed minimal. Print flaws appeared completely absent; I detected no grain, speckles, scratches, nicks, hairs or other defects. Colors looked very natural and warm, with cleanly-saturated and accurate hues throughout the film. Black levels seemed terrifically deep and dark with fine contrast, and shadow detail was clear and clean without any excessive heaviness. All in all, the movie presented a very strong image. Also good is the Dolby Digital 5.1 soundtrack of 28 Days. Unsurprisingly, the soundfield maintains a fairly heavy emphasis on the forward channels, but it proves nicely broad in any case. The front speakers provide a decently wide effect that offers music and ambiance from the sides, and the surrounds kicked in some useful material as well; light music and effects were often heard from the rears, and the entire presentation seemed acceptably encompassing. Frankly, I don't expect - or want - a very active soundfield for this kind of film, so the scope of this soundtrack appears very satisfying. Audio quality seemed fine. Dialogue usually appeared crisp and natural, with strong intelligibility. A few lines were marred by some light edginess, but those were rare exceptions. Effects were clear and realistic, with no signs of distortion. Music sounded rich and dynamic and displayed some pretty good bass at times. 28 Days won't become your "demo track", but it sounds good and it serves the film well. CTS tout 28 Days as a "special edition", and the DVD does include some interesting supplements. First up is an audio commentary from director Betty Thomas, producer Jenno Topping, editor Peter Teschner and composer Richard Gibbs. It's a reasonably interesting and lively affair, as Thomas dominates but all four participants chime in with useful information. Much of the proceedings tend to the technical side of making the film, but we hear a lot about why certain decisions were made and they even knock some of their choices. The commentary doesn't rise above the caliber of the most part - it didn't make me more fond of the movie - but I enjoyed it nonetheless. Another audio track presents an isolated score. Here we find Gibbs' music - and all the film's incidental songs as well, such as the Clash's live version of "Should I Stay Or Should I Go?" at the beginning of the movie - offered without interruption from other sounds. The track features good old Dolby Digital 5.1 audio as well. I'm not a big fan of movie music, but I always appreciate the inclusion of isolated scores, so I'm happy to find one here. Next up is a 15-minute HBO Special called "Moment By Moment". This is your usual promotional featurette that offers lots of happy talk about the movie but little depth or insight. We get a conglomeration of interview snippets from the principals intermixed with movie clips and a few "behind the scenes" shots. It's a fairly painless affair, but it lacks anything very compelling and you're likely to forget it minutes after it ends. Much more entertaining is "Santa Cruz: The Soap Within 28 Days". This 24 and a half minute feature provides the footage shot for Santa Cruz that we only see in brief snippets throughout the movie. Although the show got a little dull after a while, I still think this is a cool addition. It's a lot of fun to be able to get a better look at this sort of incidental material, just as I enjoyed the TV footage shot for Independence Day. I hope more DVDs provide this type of feature when appropriate; it's a great way to see some unusual stuff. Another odd feature is "How to Make A Gum Wrapper Chain". This stillframe section gives us step-by-step instructions in how to create this kind of piece, just as was done in the movie. I can't imagine I'll ever want to make one, but it's a neat little extra that makes the DVD a little more special. More unused footage shows up in "Character Testimonials". We see a few of these throughout the film, but we get three more here, from "Roshanda", "Bobbie Jean" and "Daniel". The first runs two minutes, 20 seconds, while the other two go for one minute, 20 seconds each; that's a total of five minutes. These are fun and lively little bits that make a nice addition to the disc; it's great that DVD can present material that doesn't make the final film but deserves a look anyway. This DVD ends with some traditional features. First are "Talent Files" for Thomas, Bullock, Buscemi, Mortensen, Ladd, and Perkins. As is almost always the case with CTS DVDs, these listings provide only the most basic information about the participants and they're essentially useless. We also find trailers for 28 Days and Big Daddy (which featured Buscemi in a minor role) plus a booklet with some brief but decent production notes. All of that creates a very nice DVD, but when the movie itself is a clunker, the quality of the disc seems pretty moot. 28 Days remains watchable at all times, but offers no greater value than that; it's standard TV movie fare that never threatens to rise above its origins. The DVD features very strong picture and sound plus some quality extras. If you're a big Bullock fan or you just like this kind of semi-inspirational material, you may want to give 28 Days rental, but I can't recommend anything more than that.